Thanks so much. I love your recipes. They are fun and easy to cook. And Gong Xi Fa Cai to you and your family. Hello there! This recipe is wonderful. My boyfriend and I like it a lot. We’re Indonesian living in the Netherlands now. I am a Tio ciu from Khuntien (West Borneo) and I found many of the recipes similar to what we have in my hometown. ^^ Thanks a lot and God bless. Erm…. Pablo, need your help here. My hubby doesn’t like the taste of Chinese mushrooms. Is there a substitute I can use? 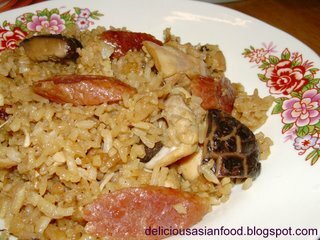 What about the water that you use to cook the rice – since I’m not using Chinese mushrooms, can I just use plain water? I bought the wrong type of beras… LOL… so now I’m desperately cooking all rice dishes in an effort to get rid of it. Amy and Ratna : Sorry I didn’t notice your comment here earlier. Thanks for the feedback and hope you’ve both had a good time with the recipes. Thanks for clearing it up, Pablo! It won’t taste the same to me without the mushrooms, but he’ll kill me if I use them. Hehe. I am most pleased to report that this recipe worked like a dream. It was SO easy to prepare, it took so quick to cook and it was all gobbled up. I cook this today and it tasted divine. Thank you for sharing. Hi! You’re heavensent! I lived in Singapore for almost 5 years and my officemates used to cook this a lot and I just simply love it because of its delicious taste and speed in preparation. I used to replicate this at home when we moved back in Manila but I guess your style ought to keep me polishing up the rough edges of my improvised dish! Xie xie ni! Terimah Kasih!